Perhaps you’ve read William Styron’s novel Sophie’s Choice, or maybe you’ve seen Meryl Streep win the best actress Oscar for her role in the movie adaptation. The story is about a woman who chooses under extreme duress which of her two young children will be allowed to live. We like to think imposing these types of sadistic choices was part of a distant Nazi past. But the Tongil Moms were forced to make heart-wrenching decisions not that long ago. These North Korean women chose to leave young children behind to make precarious journeys to escape the dangers of residing illegally in China and find asylum in South Korea, either because they couldn’t endure their forced marriages any longer or because every day they risked being captured by Chinese authorities and repatriated to North Korea where they were certain to face beatings, starvation and worse in prison camps. Because in North Korea it’s a crime to leave without permission, even if there’s no food to be found inside the country or you have to go to over the border to find goods to trade in the markets to survive. And asking for permission to leave is tantamount to a crime because it would reveal a lack of faith in the North Korean leadership. Tongil Mom Delegation and HRNK at the Heritage Foundation on November 2, 2016. From left to right: Lee Young-hee (Tongil Mom Member), Kim Jeong-ah (Tongil Mom Founder and Executive Director), Rosa Park (HRNK Director of Programs and Editor), and Hwang Hyun-jeong (Tongil Mom Member). 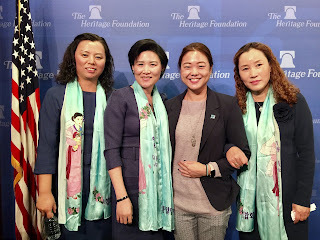 This week, three members of the Tongil Moms, an advocacy group of North Korean women who seek reunification with their children whom they left behind in China, participated at a forum on human trafficking in China at the Heritage Foundation in Washington, D.C. Three North Korean women (sometimes referred to as “defectors”) who now reside in South Korea are activists demanding their fundamental human rights to family life and privacy. Executive Director of Tongil Moms Kim Jeong-ah said, “Two [other mothers] have been included in this delegation, but the participants have changed multiple times because they could not face the trauma of having to retell their stories.” The two other members were Hwang Hyun-jeong and Lee Young-hee. Kim explains that the Chinese government's policy of forced repatriation of North Korean refugees leads to mothers having to abandon their children. Under international law, China is prohibited from returning North Korean refugees to North Korea where they face torture and other reprisals. Instead, China is obliged to offer them protection under several international treaties, including the Convention on the Elimination of All Forms of Discrimination against Women (CEDAW) and the Convention against Torture, as well as customary international law which prohibits forced repatriation (also called refoulement). But the Chinese government doesn’t comply with its international legal obligations and declares North Koreans who flee the country not to be genuine refugees but illegal immigrants coming to China for economic reasons. The Committee on the Rights of the Child (CRC) in October 2013 urged China to “cease the arrest and repatriation of citizens of the Democratic People’s Republic of Korea [North Korea], especially children, and women who have children with Chinese men, and ensure that children of mothers from the Democratic People’s Republic of Korea have access to fundamental rights, including the right to identity and education.” The CRC made similar recommendations in previous years, as have many other UN committees and human rights bodies like the Working Group on discrimination against women in law and practice. Kim said, “The last time I spoke with my daughter in 2013, she said, ‘Mom, you’ve left me haven’t you. You hate me don’t you?’ When a child says that, her mother will be devastated, don’t you think? Have you ever said that to your mother? I bet not. This is not the kind of thing that should be said between a mother and her child. Even so, the daughter I have not seen since she was five years old repeated this to me endlessly. It seemed like my world was collapsing around me.” The Tongil Moms make three demands: that children born to North Korean mothers and Chinese fathers be given proper identity documents that would entitle them to education and health care—some 20,000 to 30,000 such children are believed to be stateless, that mothers have access to their children and other parental rights, and that these children be given a choice to reunite with their mothers. The Tongil Moms decided they needed to share their stories. “I felt that we needed to come together and tell the world about the situation of these children left behind in China…to raise awareness, generate interest and get your help to work on this situation together,” Lee Young-hee told students at an event at the University of Virginia (UVA). The author is grateful to Rosa Park, HRNK Director of Programs and Editor, who conducted the interview with Kim Jeong-ah in Korean and provided translation. The author also wishes to thank HRNK’s Christopher Buchman, Soohyun Chang, and Amanda Won, who helped with the translation. HRNK thanks Henry Song (No Chain) and Bruce Klingner (Heritage Foundation) for facilitating the interview.